Are these the first images of the Nexus Tablet? UPDATE: It's most likely a production version of the Toshiba AT270 7-incher, so the_s2 earns reward points for being observant. So a new render has leaked out for some sort of Android tablet, but no one is quite sure what device this could be. 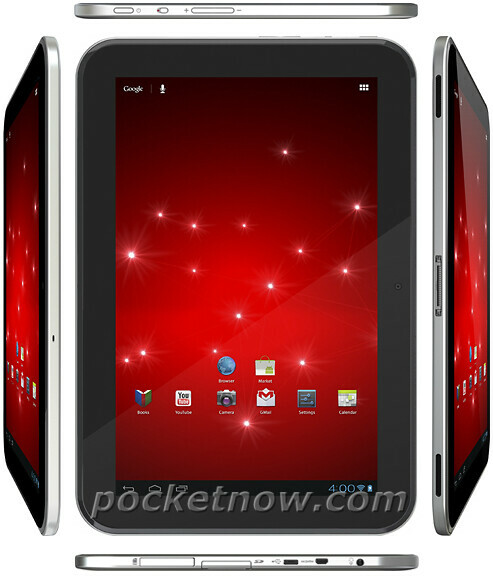 However, there are a couple of key clues that point to the idea that it may be the upcoming Nexus tablet. Of course, in general it doesn't seem very likely that this is the Nexus tablet. The idea at first glance is that the renders show nothing manufacturer specific: the apps on the home screen are all Google (although the screen shows the Android Market rather than the Google Play Store, which is suspicious), and there is no manufacturer branding on the device. The device could be around the 7" mark that is rumored for the Nexus tablet, but the problem is that the design doesn't look quite right if we're to believe that Google has commissioned Asus to adapt the MeMO 370T into a Nexus device. The MeMO had tapered edges and was noticeably thicker than this render. It wouldn't be out of the question for Google to ask for design changes to the MeMO, especially to add the various ports we see in the render, but this render looks quite a bit more like the 7.7" Toshiba tablet that we saw at CES than any Asus device. If it is a fake, it's a fairly well done fake, but it doesn't really add up for us. We'd certainly like a Nexus tablet that looks like this, but we're not sold that this is it. No problem. But its looks nice. Yes, yes it does. Looks like a Toshibia Tab to me. looks like someone took a samsung tablet mixed it with the bezels of an apple, and made it look smaller. I consider the Moto Xoom the original Nexus tablet. The Xoom was the first major tablet with Android (not counting Galaxy Tab 7), first tablet to feature the tablet based version of Android, and didn't really have any software modifications from Motorola. it was like the OG Droid. Honestly, it looks too generic. At least the Galaxy Nexus, Nexus S, G2, and G1 all had a unique look to them of sorts... Make it look like "Andy" (the green Android mascot robot thing) or a trapezoid or rhombus or something, tired of the rectangle with rounded corners, even if it is the most sensible and efficient design. Who's buying all these 7 inch tablets? I haven't seen one in the wild yet, not even the fire. Not saying they are bad, but the 10.1's are the best! Nope, not if Asus is the culprit. I'm betting they make the best looking tablet yet, just like the transformer, zenbook,@ padphone. The big clue that its not Nexus is that it has an SD card slot. Google Nexus will not as Google sees your ability to insert your own media as a problem for their new "play" marketing scheme.